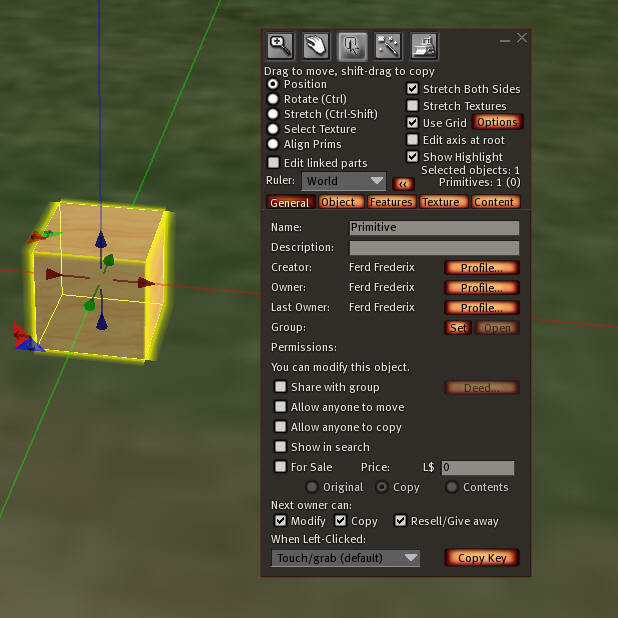 This article is part of a series on the Best Second Life tools. Remember our veterans this Memorial Day. Memorial day in the United States is coming up soon, on the last Monday in May on the 29th. Our national holiday honors those who fought and died to defend our country. Traditionally, we fly the American flag that day. 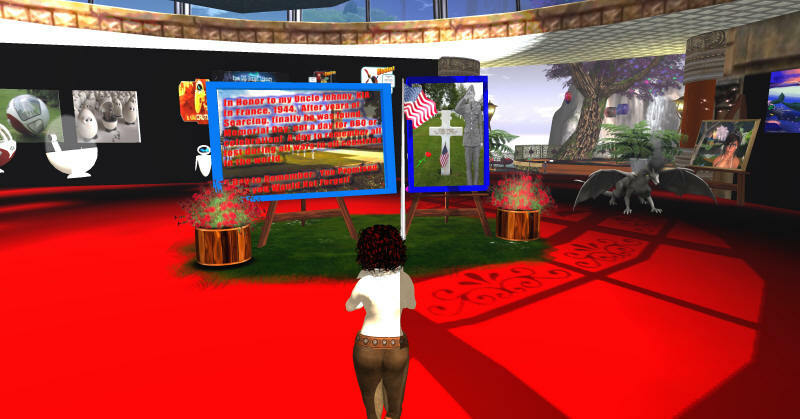 Here is a simple way to express your appreciation for our veterans ultimate sacrifice via Second Life, by adding a waving, animated American flag to your parcel. 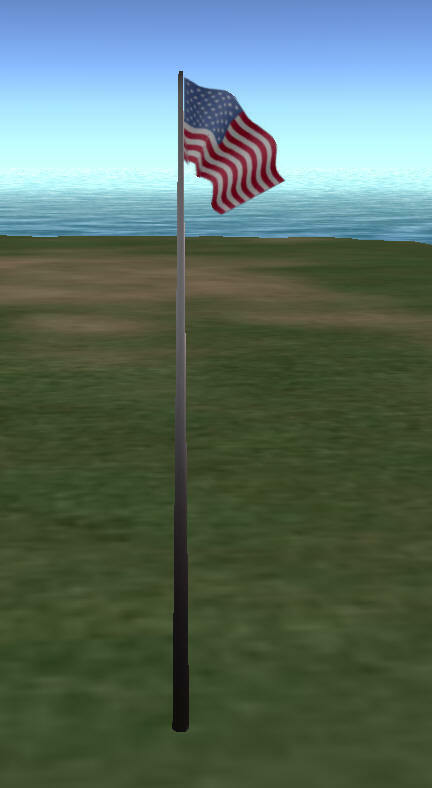 You can add your own state's flag to the display, too, provided that it is underneath the American flag, or on a separate flagpole lower than the American flag, as required by flag etiquette. You should also fly the flag of the United States at half-staff from dawn until noon local time on Memorial Day. I'd also like to mention something about one person who gave his life for our country. A dear friend of mine, Wavinggirlsav Voom, told Charlie vanAlten and me in Second Life that her mother had been looking for her brother, her Uncle Johnny, for nearly 60 years. 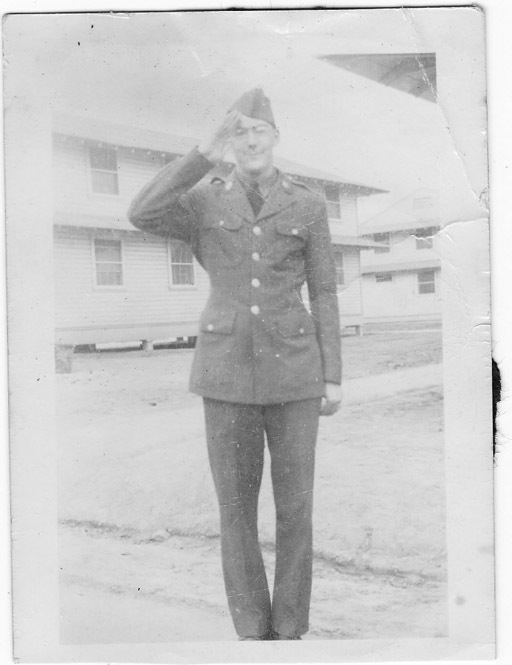 All she knew was her mom's brother had died somewhere in Europe in WW-II as he got out of a tank. All our searches reached a dead end. 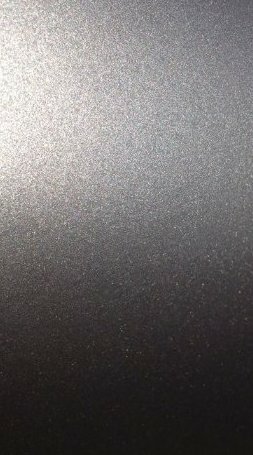 But then something happened. 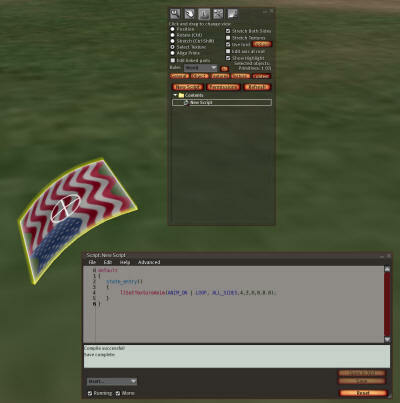 In Second Life. And we found John. 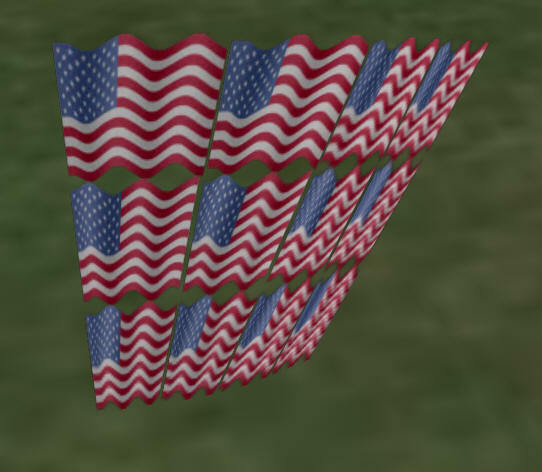 Read about Finding John Dikun in WW-II via Second Life and please, make a flag and fly it this Memorial Day. 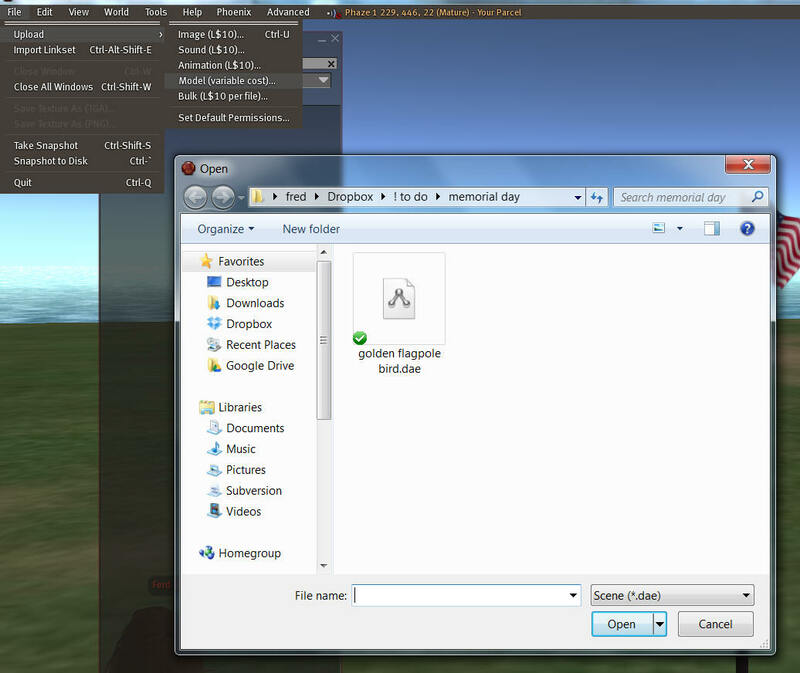 You can get all the parts for a flag from my zip file. Upload the flag texture to Second Life. 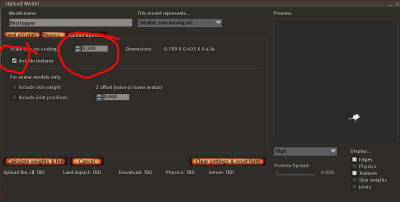 This will cost you 10L. 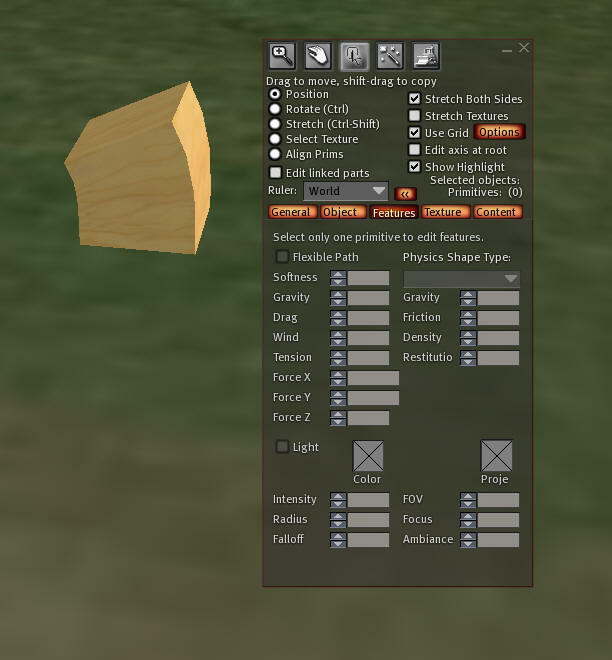 Now select 'Select Texture', click one side and set the Transparency to 0. 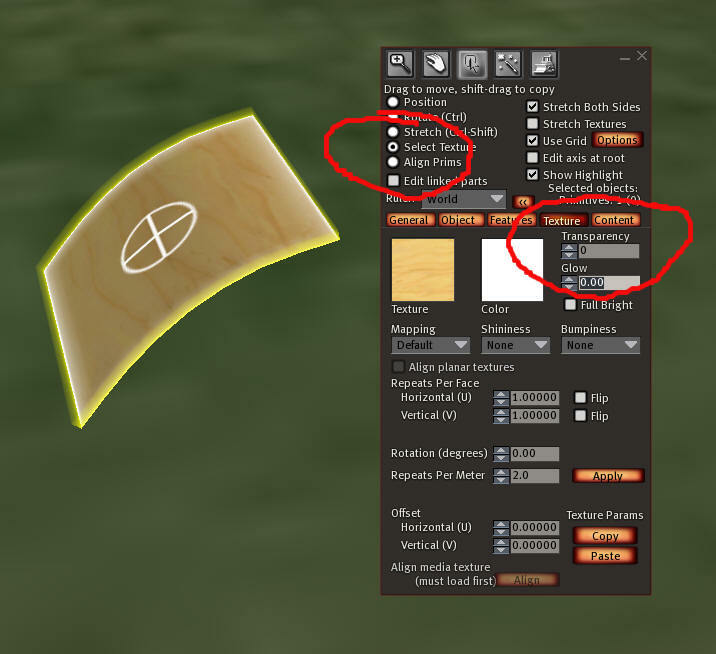 You will need to have two different textures in your flag due to the way animated images work, so we are only going to make one side of the flag at a time. 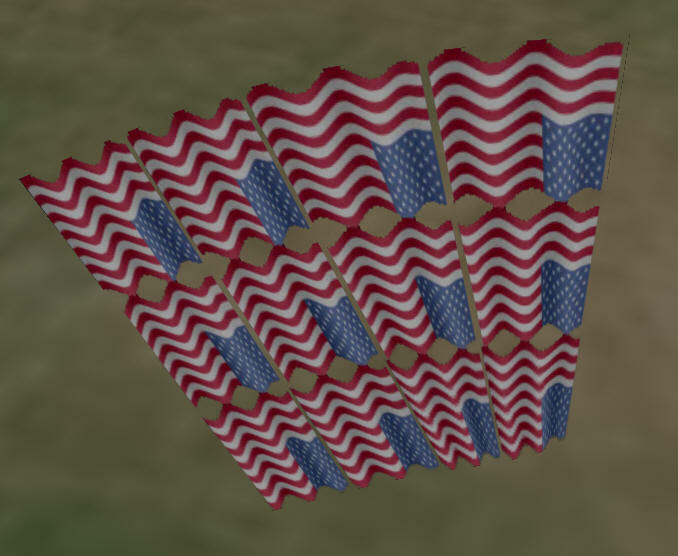 I made these flag textures from a flag from http://www.abflags.com/flags-of-the-world/north-america/united-states/. They also have all 50 state flags in animated format. 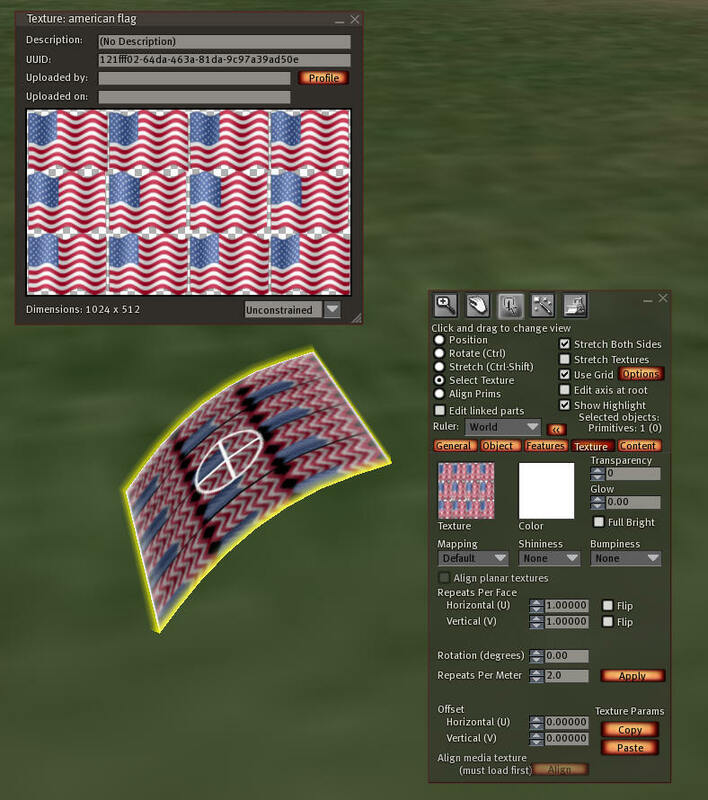 Now flip the flag over, and use the 'mirror' flag texture on the far side, and also flip it 90 degrees. 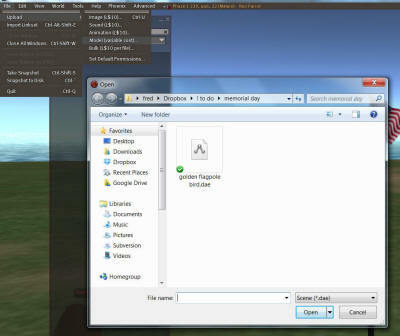 This is normal, the way animated textures work will cure all this as soon as we add the simple script. The short script is all you need. 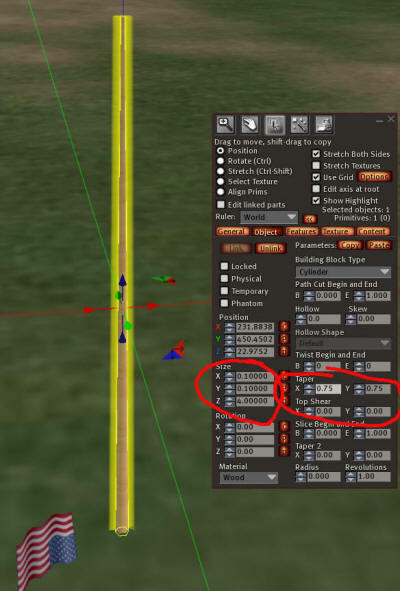 This script will animate your flag 4 frames across and 3 frames tall. 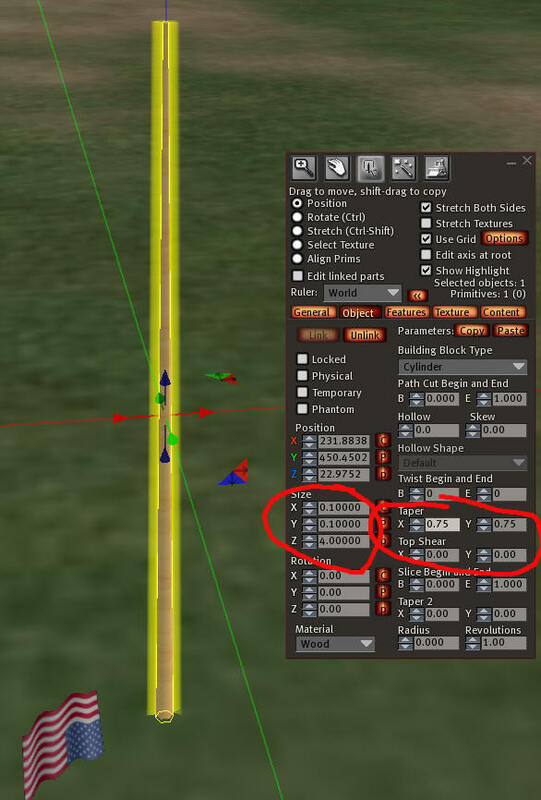 If your flags flaps too quickly or slowly, change the very last number in the script. Now set the flag at the top of the pole. 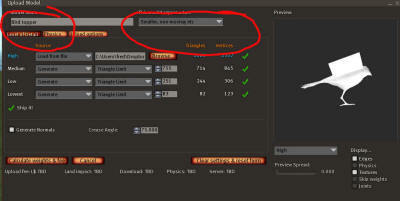 Now you can go back and play with the Flexible path settings to make your flag blow in the wind. 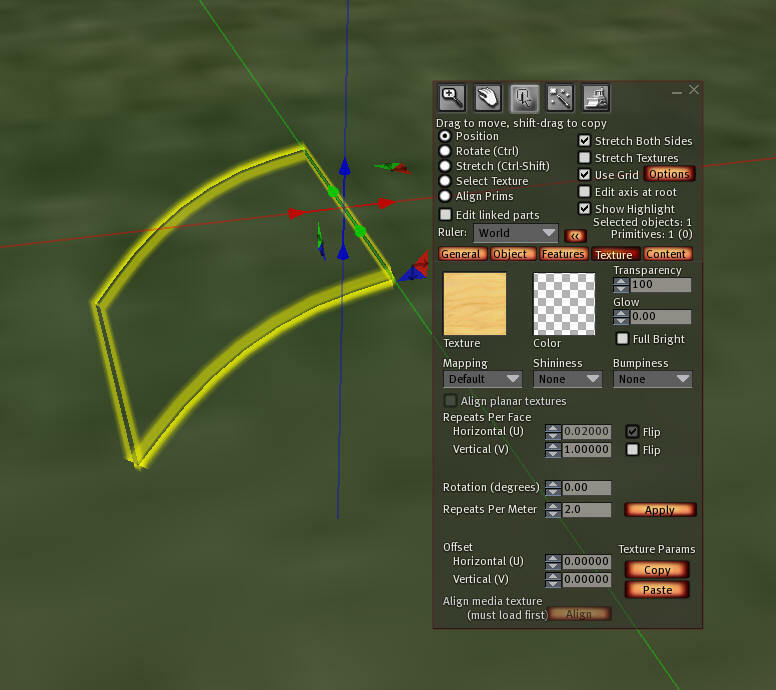 I am including a golden mesh bird 'topper' for your pole in my zip file. It takes up 4 prims and is highly detailed. 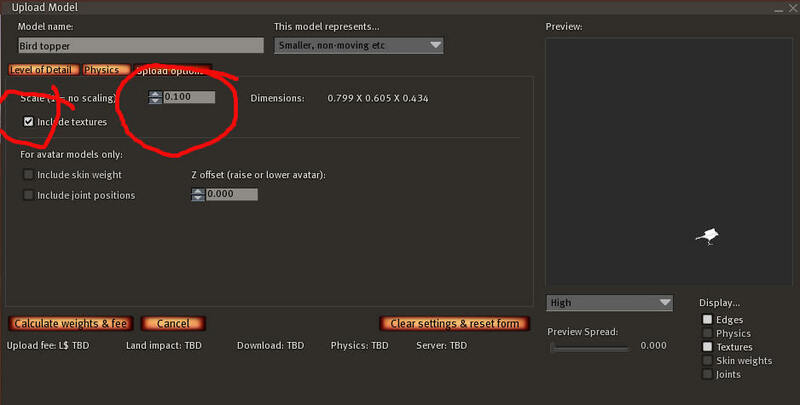 Now click the Upload Options tab and select "Include Textures" and set the size to very small, such as 0.020. 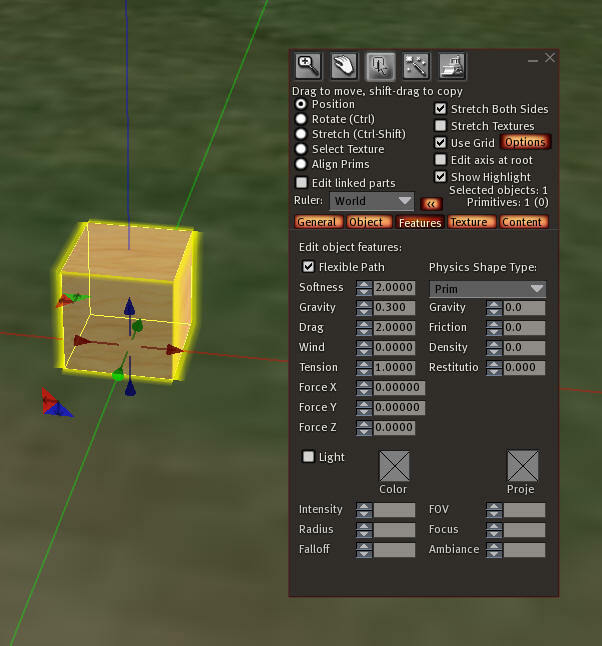 Click Calculate weights and frees and when it is finished, press Upload. 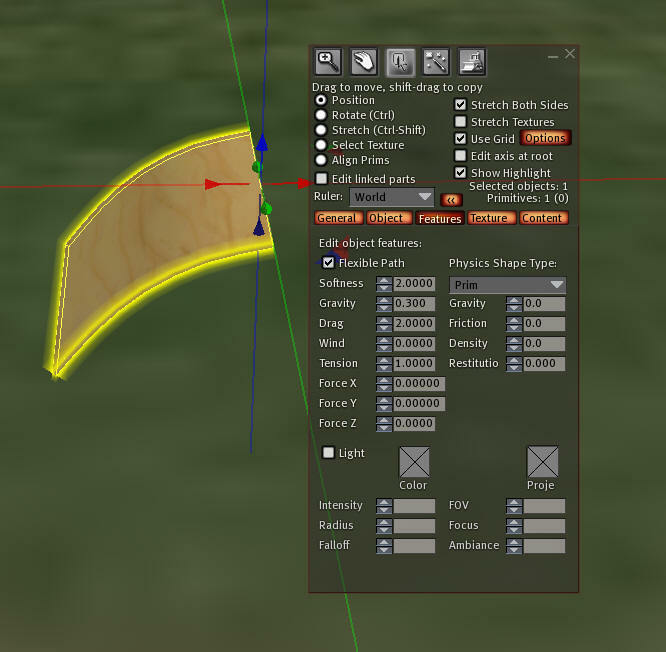 Your bird should come in with all the textures and positions set. 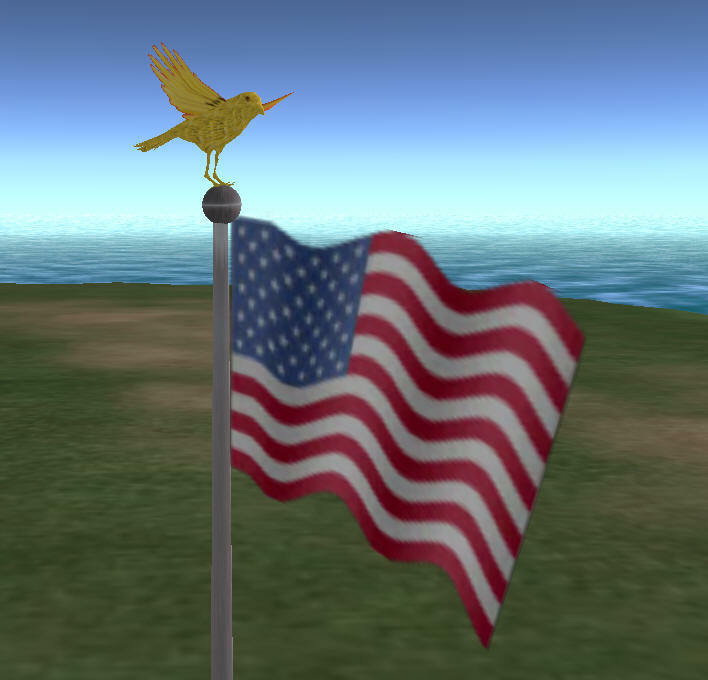 Just put it on top of the pole along with a small prim shaped like a ball and enjoy our National Holiday!